Also serving communities of N Fond Du Lac. There are 12 Assisted Living Facilities in the Fond Du Lac area, with 11 in Fond Du Lac and 1 nearby. To help you with your search, browse the 17 reviews below for assisted living facilities in Fond Du Lac. On average, consumers rate assisted living in Fond Du Lac 4.3 out of 5 stars. Better rated regions include Ripon with an average rating of 4.4 out of 5 stars. Caring.com has helped thousands of families find high-quality senior care. To speak with one of our Family Advisors about assisted living options and costs in Fond Du Lac, call (855) 863-8283. Fond du Lac is situated on the southern shore of Lake Winnebago in the eastern half of Wisconsin. With an approximate senior population of 6,850, Fond du Lac serves provides its older citizens with 11 assisted living facilities within the city and three in the neighboring area. 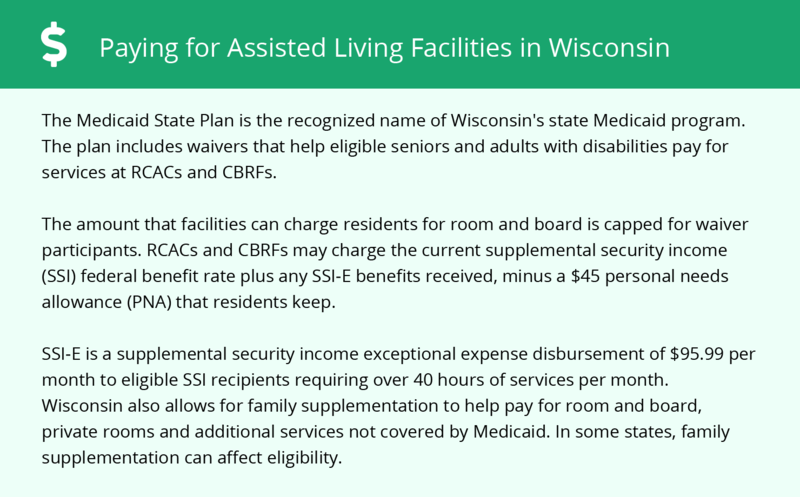 In the state of Wisconsin, the Department of Health Services licenses and regulates four types of assisted living facilities (ALF) and programs. These services include adult day care, adult family homes, community-based residential facilities and residential care apartment complexes. Fond du Lac Area Transit is the city's local public transit system. A reduced fare program is offered to senior citizens 65 years of age or older and disabled persons. The nearest major airports to Fond du Lac - Green Bay Austin Straubel International Airport and General Mitchell International Airport - are both around 70 miles away. Seniors who fly often should consider Fond du Lac's proximity to airports. The Fond du Lac area is home to world-class medical facilities, including St. Agnes Hospital, in the event of medical emergencies or illness. Fond du Lac has an array of community resources for seniors, including The Fond du Lac Senior Center, an organization that provides citizens aged 50 and older with free laptops to use, organized travel opportunities and various recreational activities. Fond du Lac maintains a dry, cold climate with harsh, windy winters. Average temperatures range from 70 degrees in the summer to 20 degrees in the winter. Because temperatures can drop below zero in Fond du Lac, seniors should consider their individual ability to manage the cold weather before moving to the area. Relative to the rest of Wisconsin, Fond du Lac's crime rate is 86 percent higher than the average rate for all other cities throughout the state. Based on this data, living in Fond du Lac might create unsafe situations for seniors. The air quality in Fond du Lac is approximately 10 percent better for you than the national average air quality. Air quality is determined by the number of harmful air pollutants and is important for seniors with lung conditions to consider. Assisted Living costs in Fond Du Lac start around $0 per month on average, while the nationwide average cost of assisted living is $4,000 per month, according to the latest figures from Genworth’s Cost of Care Survey. It’s important to note that assisted living rates in Fond Du Lac and the surrounding suburbs can vary widely based on factors such as location, the level of care needed, apartment size and the types of amenities offered at each community. Medicaid recipients can apply for Wisconsin's Medical Assistance Personal Care program when residing in an ALF with less than 20 residents. 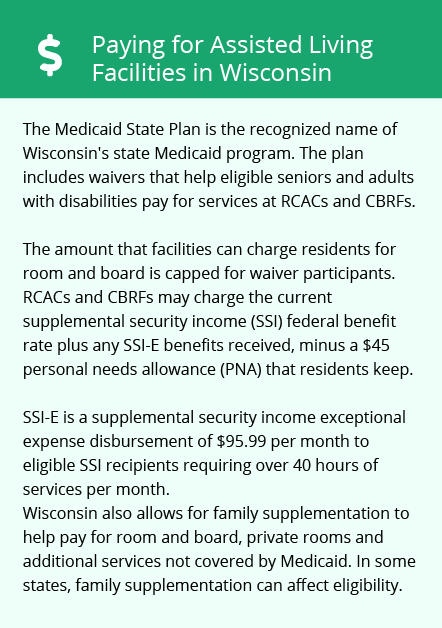 Wisconsin also provides qualifying seniors with additional Social Security income to help pay for assisted living through the Exceptional Expense Supplement for Meembers of Supplemental Security Income (SSI) program. Fond Du Lac and the surrounding area are home to numerous government agencies and non-profit organizations offering help for seniors searching for or currently residing in an assisted living community. These organizations can also provide assistance in a number of other eldercare services such as geriatric care management, elder law advice, estate planning, finding home care and health and wellness programs. To see a list of free assisted living resources in Fond Du Lac, please visit our Assisted Living in Wisconsin page. Fond Du Lac-area assisted living communities must adhere to the comprehensive set of state laws and regulations that all assisted living communities in Wisconsin are required to follow. Visit our Assisted Living in Wisconsin page for more information about these laws.